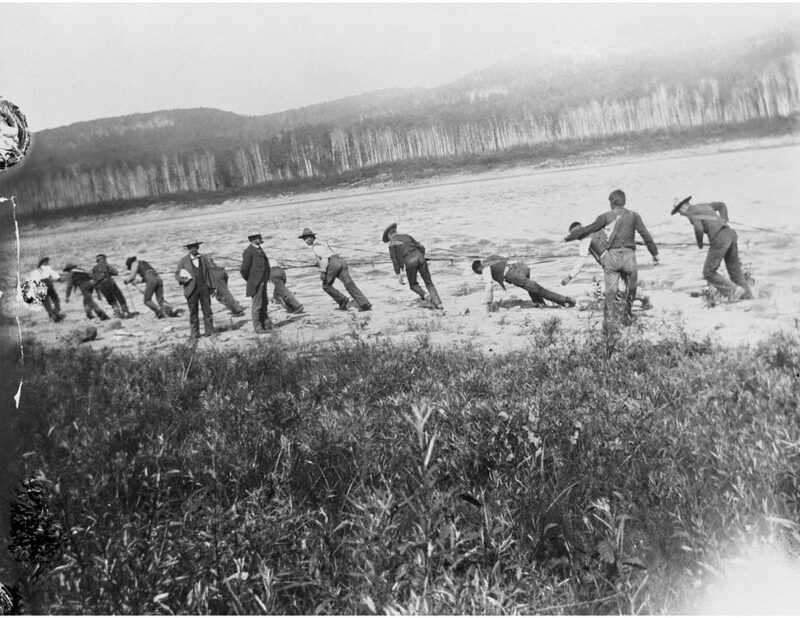 This tracking image is used with the permission of the Glenbow Archives, image na-949-115. The guide yells “Haul, Haul,” while the voyageurs pull the boats upriver and the gentlemen stand by, watching. As you know I have been taking a holiday, spending time in the Archives and also in editing my third book. In looking up what John Franklin had to say of the Athabasca, Slave, and Mackenzie Rivers for a book sometime in the future, I stumbled on what he had to say of coming up the Hayes River to Norway House and beyond. Its really interesting! These quotes are taken from Narrative of a Journey to the Shores of the Polar Sea in the years 1819, 20, 21, and 22, by John Franklin, Captain R.N., F.R.S., and Commander of the Expedition. By the way, the maps in this book are spectacular! The version I accessed in BCA was published in 1823 by John Murray, London, NW 998 F832. This copy, by the way, was owned by William Charles, younger brother of John Charles who took out the York Factory Express in 1849. When I write his story, you will find it here. http://nancymargueriteanderson.com/john-charles/ . But that is not yet. So John Franklin arrived at York Factory in late summer 1819, and began to make his way up the Hayes River on September 9th. On the 9th of September, our boat being completed, arrangements were made for our departure as soon as the tide should serve…We embarked at noon, and were honoured with a salute of eight guns and three cheers from the Governor and all the inmates of the fort, assembled to witness our departure. We gratefully returned their cheers, and then made sail, much delighted at having now commenced our voyage into the interior of America. The wind and tide failing us at the distance of six miles above the Factory, and the current being too rapid for using oars to advantage, the crew had to commence tracking, or dragging the boat by a line, to which they were harnessed. This operation is extremely laborious in these rivers. Our men were obliged to walk along the steep declivity of a high bank, rendered at this season soft and slippery by frequent rains, and their progress was often further impeded by fallen trees which, having slipped from the verge of the thick wood above, hung on the face of the bank in a great variety of directions. Notwithstanding these obstacles, however, we advanced at the rate of two miles an hour, one-half of the crew relieving the other at intervals of an hour and a half. Steel River, through which our course lay, is about three hundred yards wide at its mouth; its banks have more elevation than those of Hayes’ River, but they shelve more gradually down to the stream, and afford a tolerably good towing path, which compensates, in some degree, for the rapids and frequent shoals that impede its navigation. They passed up the Hill [Hayes] River, where the banks were higher and “have a more broken outline, than those of Steel or Hayes’ Rivers. The cliffs of alluvial clay rose in some places to the height of eighty or ninety feet above the stream, and were surmounted by hills about two hundred feet high..” On September 17 his boat reached the Rock Portage. I knew there had been a house there, and yes, Rock House is mentioned in this section of his journal. After this we recommenced our voyage, and having pulled nearly a mile, arrived at Borrowick’s Fall, where the boat was dragged up with a line, after part of the cargo had been carried over a small portage. From this place to the Mud Portage, a distance of a mile and three quarters, the boats were pushed on with poles against a very rapid stream. The upper part of Hill River swells out considerably, and at Morgan’s Rocks, where it is three quarters of a mile wide, we were gratified with a more extensive prospect of the country than any we had enjoyed since leaving York Factory. The banks of the river here, consisting of low flat rocks with intermediate swamps, permitted us to obtain views of the interior, the surface of which is broken into a multitude of cone-shaped hills. The highest of these hills, which gives a name to the river, has an elevation not exceeding six hundred feet…The beauty of the scenery, dressed in the tints of autumn, called forth our admiration, and was the subject of Mr. Hood’s accurate pencil. [This drawing is in the book]. On the 20th we passed Upper Burntwood and Rocky Ledge Portages, besides several strong spouts; and in the evening arrived at Smooth Rock Portage, where we encamped. The men who were hauling the boat upriver were all Orkneymen, of course. Franklin says “It is not easy for any but an eye-witness to form an adequate idea of the exertions of the Orkney boatmen in the navigation of this river. The necessity they are under of frequently jumping into the water to lift the boats over the rocks, compels them to remain the whole day in wet clothes, at a season when the temperature is far below the freezing point. At six on the morning of the 21st, we left our encampment, and soon after arrived at the Mossy Portage, where the cargoes were carried through a deep bog for a quarter of a mile. The river swells out, above this portage, to the breadth of several miles, and as the islands are numerous there are a great variety of channels. Night overtook us before we arrived at the Second Portage, so named from its being the second in the passage down the river. Our whole distance this day was one mile and a quarter. On the 22nd our route led us amongst many wooded islands, which lying in long vistas, produced scenes of much beauty. In the course of the day we crossed the Upper Portage, surmounted the Devil’s Landing Place, and urged the boat with poles through Groundwater Creek. At the upper end of this creek, our bowman having given the boat too broad a sheer, to avoid the rock, it was caught on the broadside by the current, and in defiance of our utmost exertions, hurried down the rapid…We encamped in the dusk of the evening amidst a heavy thunder-storm, having advanced two miles and three quarters. About ten in the morning of the 23d we arrived at the Dramstone, which is hailed with pleasure by the boats’ crews, as marking the termination of the laborious ascent of Hill River. We complied with the custom from when it derives its name, and soon after landing upon Sail Island prepared breakfast…. The island is called Sail Island because the crews cut a new mast for their sail. Their old mast they had thrown away downriver, as they wouldn’t need it in the steep part of Hayes River. Sail Island appears in some of the York Factory Express journals too, and this cutting of a new mast is also part of the tradition of the York Factory Express men. “We left Sail Island with a fair wind, and soon afterwards arrived at a depot situated on Swampy Lake, where we received a supply of mouldy pemmican. Mr. Calder and his attendant were the only tenants of this cheerless abode, and their only food was the wretched stuff with which they supplied us, the lake not yielding fish at this season. After a short delay at this post, we sailed through the remainder of Swampy Lake, and slept at the Lower Portage in Jack River; the distance sailed to-day being sixteen miles and a half. In the York Factory Express journals, Jack River, or Jack Tent River, runs between Swampy Lake and Knee Lake. It is good to know that there was once a post on Swampy Lake, because it is mentioned in some of the journals. But, according to this, I have the Dramstone in the wrong place, as it is before Swampy Lake and not after. But as the name, Dramstone, was no longer used by the York Factory Express men, it was hard for me place correctly. Reading this journal is a great help to me. You can never know too much, and you will never know everything you need to know. By the way, the York Factory Express book will be published in April 2019, just in case you didn’t know.